Have you ever heard someone say that after they hurt such and such body part that all of a sudden a whole slew of other injuries started? I hear this all the time, and there is a lot of truth behind it. Especially when it comes to the foot and achilles tendon! You see the foot is the body’s first line of defense to absorb and transmit force, your achilles tendon plays a major role in this. The foot hits the ground first thing in the morning and with every step you take during the day it must absorb and transmit force. However, when injured this capability becomes impaired. So what happens when you have achilles pain? The body says “next man up”. Meaning your knee, hip, and back on either side start to take the brunt of the impact. If you do this repetitively, there is a pretty good chance something will start getting a little cranky. I’ve treated a variety of Achilles injuries. Runners with chronic Achilles pain, partial tears, and post-surgical clients. I can tell you from firsthand experience that individuals who have been dealing with this for a prolonged period of time tend to have other issues as well. Most common tends to be the opposite hip from working overtime, but it could manifest itself in other forms as well. Often times the problem with these individuals is that they have been performing the same stretches over and over again for months on end without much improvement in symptoms or overall ability because that is what their doctor, PT, or Chiropractor told them to do. Stretching could be part of the solution. However, chances are if you have not made improvement by now, then that is not the answer. Remember how I said the Achilles tendon's job is to absorb and transmit forces? Well stretching does not necessarily accomplish this mechanism. Think about a rubber band. The more you stretch it, the more it becomes loose and decreases its ability to create force or tension. The same concept applies to your tendons. Don't get me wrong, they need a baseline level of flexibility, but more does not necessarily mean better. The solution? Creating useful stiffness and strength in the tendon so that it has the resiliency to absorb force all day long when you are walking, going up/down stairs, jogging, or playing a sport. You have probably seen a calf raise before. This exercise, especially done at particular tempos and angles proves to be effective for a lot of people. However, a lot of times people will have pain with this activity so it makes it really hard to progressively load the tendon. 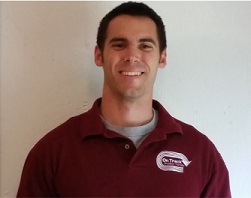 At On Track Physical Therapy we also utilize a method called blood flow restriction training. This allows us to make strength gains with very low loads of resistance. Research has also shown how it can increase human growth hormone (this hormone has been known to improve tendon recovery). Another method for pain reduction used is Dry Needling. Which has been shown to improve pain in the short term. Allowing us to effectively strength train the tendon in a more pain free environment. 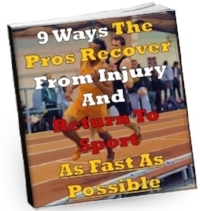 For free tips on how the pros recover faster from injury, click the picture on the left. If you'd like to get help AS SOON AS possible then enquire about a FREE discovery session below. Ankle mobility is often limited in many individuals. A lack of ankle range of motion can reduce ones ability to squat among other things. Unfortunately typical methods of stretching the calf or foam rolling your calf muscles leads to results that are temporary and less than desirable. I have found these couple drills to be very effective at improving ones ankle mobility. The key to this activity is the duration that it is performed which imposes a stress to the joint/tissue and forces it to adapt. The second key to the exercise is the isometric contractions of the muscles around the joint in the end range of motion. This teaches the body how to display control in the outer limits of its current mobility. A pattern that rehab professionals will often strive to improve when working on ankle mobility is the squat. The rules of specificity would say that we would then need to squat with the newly acquired ankle range of motion. I like this drill as it imposes similar stresses as the exercise above, but it is done with a squatting movement. Give it a try and see what you think. Don't forget to test the squat before the exercises, then after the exercises and see if you feel or see a noticeable difference. At On Track Physical Therapy we are constantly looking at ankle range of motion. Ankle range of motion can have a large impact on the body's ability to move functionally i.e. squat, jump, run, lunge. Here is a quick ankle fix that often works well to improve ankle range of motion. Repeated plantarflexion ankle mobilizations are a great way to improve a stiff ankle and increase both ankle dorsiflexion and plantarflexion. Often time people will only stretch or mobilize the ankle into dorsiflexion to improve dorsiflexion. It may seem a little counter intuitive, but actually moving the ankle through a full range of motion in the opposite direction will work wonders. This is possibly due to the mechanical stimulus that reaching end range of motion and gaping the ankle mortise can have an effect on global ankle mobility.